Omega VERT VRT330HD Vertical VRT 330 Juicer- Excellent for juicing leafy greens, wheatgrass and fruits. 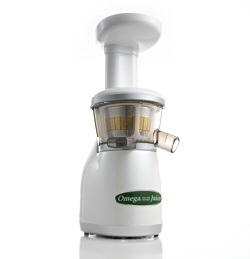 The Omega VRT330HD Juicer is Omega's newest single auger Heavy Duty juicer. Its low speed of 80 RPMs results in minimal heat build up and oxidation promoting healthy enzymes and longer lasting juices. Designed and engineered for health conscious individuals who want a greater variety in their daily juicing routine, the VRT 330HD has the ability to juice everything from wheat grass, leafy greens, fruits and vegetables. In our tests it is the most efficient single auger style juicer to date! The Omega VRT 330HD is identical to the Omega VRT 350HD except for the color. The Omega VRT350HD is black and silver and the Omega VRT330HD is white. The Omega VRT330HD juicer takes the horizontal single auger design and takes the concept one step further.. 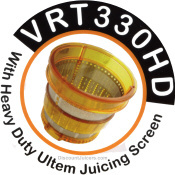 The "heart" of the all-new VRT330HD is the ultem screen. This is what makes the VRT330HD Heavy Duty. The Ultem Screen is 8 times stronger than the normal plastic screen that is included with the VRT330. We recommend it for people that want to juice daily. Reap all of the benefits of a Single Auger Masticating Juicer in less space than most juicers on the market! Why the Omega VRT330HD Juicer? Low Speed Technology System (LSTS) - World's first patented juicer utilizing the LSTS method. It is a complete departure from the standard masticating method. The LSTS method allows the Slow Juicer to extract the maximum amount of nutrients, vitamins, taste and juice from a minimum amount of fruits, vegetables, leafy greens, even soybeans! Heavy Duty (HD) - This model Omega VERT is more durable than the original Omega VRT330 due to the HD Juicing Screen. Dual Stage Juicing - juice is extracted through the first crushing stage and before the pulp is ejected, it is then squeezed during the second pressing stage; resulting in more juice, and extremely dry pulp. Automatic Wiping System (AWS) - World's first juicer with AWS. This juicer utilizes a silicone wiping blade, much like the wiping blade on your car that ensures the juicing screen stays clear of excess pulp so you will enjoy a higher yield and easier to clean screen. Higher yields - Based on our testing, this juicer yields more juice than a comparable centrifugal ejection juicer. Higher Quality Juice - Enjoy more antioxidants, better flavor and superior freshness of your juice. No frothing or foaming, and none of the separation that occurs with other juicers. Self Cleaning - Simply pour water through to self clean the juicer when changing to another fruit, vegetable or leafy green. Save time! This juicer features a patented, stone mill-like screw, made of GEs ULTEM material, which is 8 times stronger than augers on other single auger juicers. The VRT330HD auger turns at a low 80 RPMs to ensure that nothing is lost through heated elements in your juice. 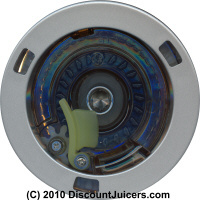 This low speed also helps the Omega VRT330HD foam less than a twin gear style juicer. The OmegaVRT330HD juicer's low speed of 80 RPM's ensures full taste and the highest nutritional value. The Omega VRT330HD juicer is easy to assemble and disassemble for quick cleaning. The Omega VRT330HD Nutrition Center assures you many years of trouble-free, dependable service. Ten Year warranty on all parts and labor. Unlike other juicers, it does not offer "multi-function" use. It was designed from the ground-up as a juicer, and that's what it does extremely well. The Omega VRT330HD is our favorite dual-stage Vertical Single Auger Juicer. The vertical design has a smaller footprint than the horizontal single auger. In our tests, its more efficient as well. It takes us under 4 minutes to clean. The only difference is that the HD models have the Heavy Duty 8x Harder Screen. We now include the upgraded bowl that has the pulp extraction rubber plug on a hinge, so it won't get lost and a 28% larger pulp ejection port. Get maximum amount of juice with a minimum amount of produce. Peels and skins can be used in cookie, jam, cake, etc. Simply rinse with water while changing fruit and take it apart after using and rinse with water.. It couldn't be any easier! The Omega VRT330HD juicer minimizes the noise by squeezing slowly rather than grinding at high speed like centrifugal juicers. The 8x harder auger is manufacturered out of GE Ultem material. The 10 Year Warranty on the entire juicer is your assurance that the Omega VRT330HD juicer is built to last. There is no need to purchase a costly an extended warranty. The Omega VRT330HD juicer excels at making juice out of your favorite leafy greens and wheatgrass. Makes a full-bodied, pulpier juice compared to other juicers.